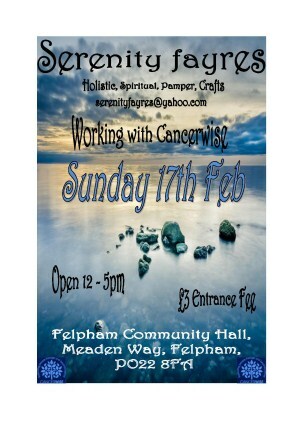 Serenity Fayres Working with our partner Cancerwise to bring an inspirational event to soothe, cleanse and inspire your mind, body and spirit. Offering you experiences in holistic, wellbeing, therapies, skills in self-development, and a sense of spiritual understanding. Also available a wide range of Pampering, Holistic and Retail opportunities. Relax and energize yourself at our events with complementary therapies, retail therapy and see, try and buy some of the best products on the market - everything from holistic and spa products, all sorts of wonderful products such as crystals, jewellery, clothing, essential oils, scented sprays, skincare eco friendly, wellbeing and body. Your entry fee of £3 includes inspirational talks and demonstrations throughout the day. Parking is free and refreshments are available to purchase. It’s a great day out to spend time with your friends and family, and we all need that.